One ruby-red, spiral-bound notebook. One vivid imagination. In the hands of a fifth grader, these seem like perfect tools for idle time. 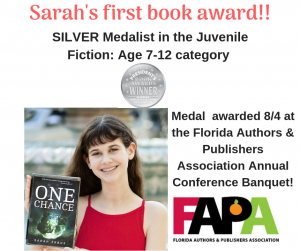 And for Sarah Frank, they proved to be just that — a creative outlet. 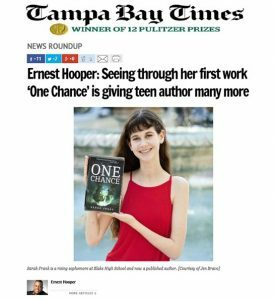 While squirreled away in her bedroom, she embarked on writing a “story” about orphans and magic, escalating adventures and time travel, never intending to share her writings with anyone. Then she added a, “purple Sharpie” to the mix. And everything changed. 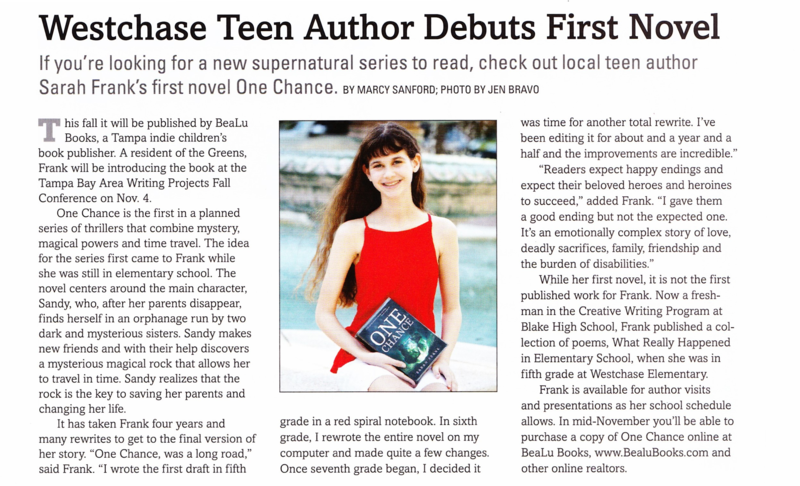 “Somewhere in the middle — maybe just after I ended a chapter with a character saying, ‘We only have one chance’ — I realized I liked the sound of those last two words and I decided to make One Chance the title,” said Sarah, now a rising sophomore at Blake High School. “Once I wrote the title in this thick purple Sharpie (which definitely didn’t match the ruby red) on the cover, it started to feel real. More than four years after that epiphany, Sarah peddles her first novel, One Chance, published last November by BeaLu Books. News article about Sarah’s new book!